If you’re the sort that doesn’t like fall, or likes it simply because there’s certain coffee drinks now available, we probably wouldn’t get along. It’s akin to being someone who doesn’t understand why bacon is a thing, doesn’t regard baseball as an awesome sport, or someone who dislikes animals. You might even hate tobacco and those who smoke it. We’re just different tribes. That’s fine, and you can go enjoy your thing on your time—away from me. This is my time. There’s a delicate changing of the guard between vibrant life and vibrant decay with which many of us above or below a certain latitude are blessed to experience every year. If you’re reading this, your pipes are a natural part of your routine as much as mine, and seasons definitely matter. 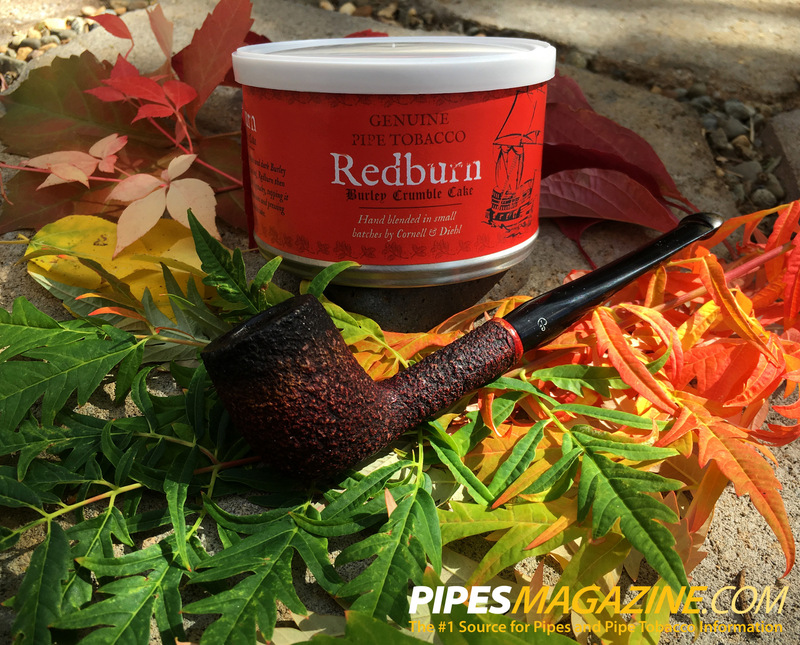 Cornell & Diehl recently debuted "Redburn," a small-batch crumble cake consisting of Burley, light and red Virginia, dark-fired Kentucky leaf with a kiss of rum as a topping. The label alone is a screaming autumn-red and I genuinely, if not skeptically, enjoy a good Burley-forward mixture. 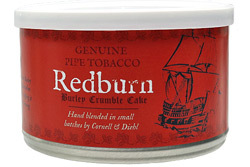 Crumble cakes are an interesting method of doing pipe tobacco. They’re easier to deal with than a plug but they might be daunting if you’re unfamiliar with loading your pipe. Redburn’s take on this is almost spongy and it delightfully pulls apart like a pork shoulder that’s been smoking all day. You have to deal with it correctly and there’s certain ways to deal with it–no knife necessary. Redburn smells barely of rum, but has a treacle-fig nose to it once broken apart. This encouraged me, because toppings for pipe tobacco can range from overkill to downright nonexistent. Loading a pipe with a range of chopped to nearly ribbon-like tobacco can be a tad tricky. Half the time I encountered "sniper leaves" of tobacco that blocked the airway, but nothing a pipe cleaner couldn’t push out of the way. There’s a balance of roughing up the tobacco too much and not enough. Once achieved, lighting is easier if this stuff is broken apart and left to dry out a bit, but when it does, the delicacy of the burn is rather impressive. 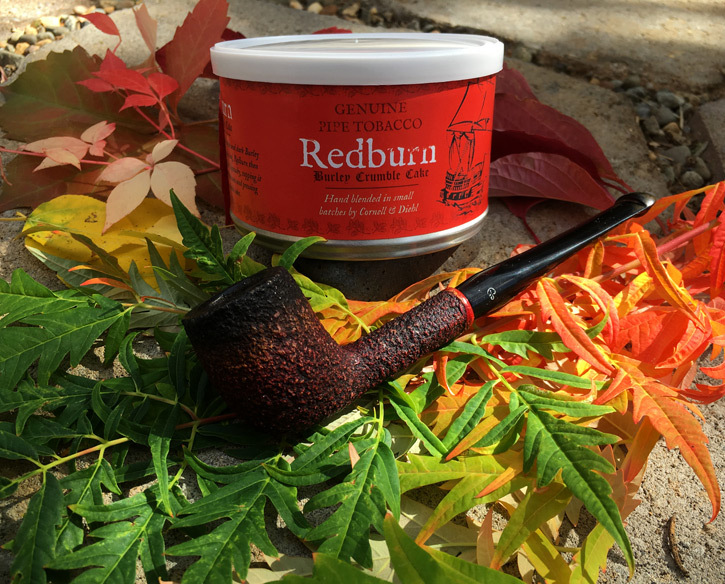 I found Redburn to be easy as hell to smoke right from the beginning. The nutty smoothness of the Burley and buttered bread hints from the red Virginia is there at the start, and there’s a nice tongue-prickle likely from the pinch Kentucky dark-fired. If topping is going to be an issue, this is where I brace myself, and I can say without reservation it’s not problematic. I couldn’t even tell it was there. This tobacco isn’t overwhelming to the senses, but it has a little kick to it. Moderate nicotine levels midway through let you know it is present and accounted for, while delivering just the right amount of character. The Kentucky sits in the background, without being tongue-coating. The bright Virginia pushes some pleasant sharpness past its red counterpart, and there’s no bitterness from substandard Burley—which means the quality was selected properly. One of my biggest complaints about Burley is how it can, at times, be a mere filler rather than a focus. Redburn didn’t seem to have these thick, leathery leaves but rather the paper-thin and delicious sort. Managing a bowlful of Redburn is almost effortless, but it’s advisable to keep tamping light and less often. This tobacco likes some natural, gentle puffing. It likes to breathe, but not too much. Quick smokers might experience some angry taste buds, whereas the patient let-it-smolder sorts will enjoy keen rewards. Keeping this in mind is important for the end of the bowl, as I’ve found with some Burley there can be ashy and bitter components, perhaps from tamping and stoking embers too hot. Done right, there can be a black tea background with an almost roasted chestnut experience. Not a bad way to end a smoke. Lighter whiskeys and beers would be my choice for a beverage companion. Coffee tended to be okay for the morning, but since tea was mentioned, you’d do good sipping that perhaps a bit more. 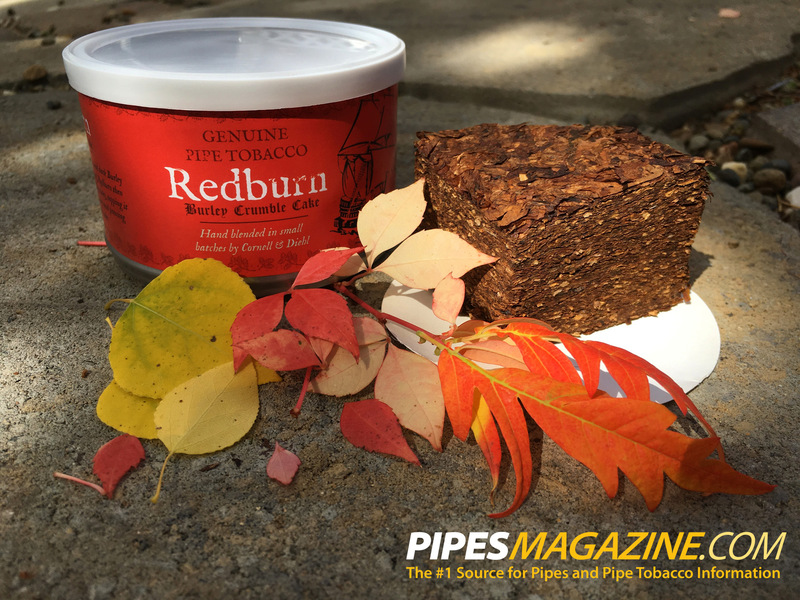 Redburn is a great tobacco. It gives a great Burley experience though the pairing of the companion tobaccos is unusual. Most notably there isn’t an unnatural sweetness meddling with the mixture. I’m not going to say it’s an "advanced" smoke, but seasoned smokers that are into Burleys should grab a tin of this. Aging may or may not do a lot for it, but time will tell. The fresh product is completely ready to go. My overall experience with this tin has been an excellent one. Maybe I’m mesmerized by crisp mornings and the cacophony of fall colors, but this tobacco gave me quite a few decent sits on the porch. Changes of seasons are inevitable, and being a pipe smoker it’s good to find new things to enrich a fella’s day. Happy fall and smoking, everyone. Except those who can’t see past nature’s brief periods of splendor. Life is too damned short, and these momentary pleasures are a great way to combat this fact. Your experience is exactly what I was expecting from this tobacco…however, all I got was an unpleasantly strong topping which to me smells like a permanent marker. Same thing with Haddo’s Delight. Since Haddo’s seems to be so well-received and enjoyed, I’m guessing this issue lies with me, and not the tobacco. I’m bummed! Very nice write up. Haddo’s Delight is a wonderful tobacco! Permanent marker scent? That’s the first I’ve heard anyone mention that…could be you…did you have a bad experience sniffing markers in your youth? I keenly remember getting in trouble huffing the blueberry-scented dry erase markers that became available when I was in the fifth grade. The brain damage was minimal, I’m sure. Glad you enjoyed the article, bummer the tobacco didn’t jive with you as it should have. I hit up a local B&M a month ago and one of the guys bought the tin on a whim. He opened it up and offered a bowl to everyone. I liked it from the first bowl. Just received the first full tin and I’m on my second bowl of it now. It has an interesting flavor profile. I’ve noticed it’s kinda pronounced at the beginning and end of the bowl. In the middle of the bowl it kind of mellows out a bit for some reason I can’t quite pinpoint. Definitely the slower you puff the better it is. The rum top dressing wasn’t too strong to me. I wouldn’t really call this an aromatic in the sense of the American aromatic definition. I’ll definitely be stocking the cellar with this. Loved the way you described this right down to the Bacon. Yeah, with you on Fall all the way being that I am from the Southern tip of New Jersey where the Fall months grace the meeting of Victorian and the Atlantic. Great time of year for great Tobacco. Red Burn sounds like my kind of smoke and going to secure some today, albeit online and not local. Thanks for the review. I’ll report upon smoking a few bowls. Thanks for another well written and nicely illustrated review. I still have about a quarter of a “brick” left–a little goes a long way. Still enjoying it and I should probably switch to next month’s tobacco a little more. One thing I want to add that I did not in the article: a clean pipe. This is one of those tobaccos that I call a “ghost hunter.” If you smoke anything Latakia, Lakeland and I presume aromatics, you’re going to find undertones that aren’t there. Let this be said for estate pipes you may have recently acquired. I’m not one to often have a pipe exclusively for a particular brand or line of tobacco, I usually just separate them into Latakia and non-Latakia. It works decently for this tobacco, but also, cleanliness being next to godliness, you’ll be better off with Redburn. Well, here I am a month later, and after picking up a couple of tins on the strength of your review. I’ve had several bowls now, and I can’t thank you enough for turning me on to this blend. Many thanks, Kyle. …and you’re welcome—enjoy! I wish I hadn’t smoked up the tin so quickly, myself.